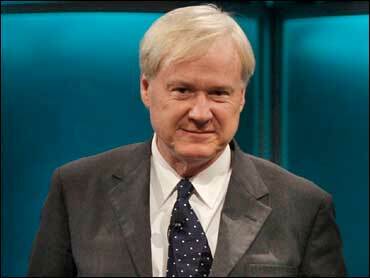 PASADENA, Calif. -- MSNBC's Chris Matthews apologized for joking about a "Bill Cosby pill" while awaiting an interview with Hillary Clinton two years ago. Matthews has been criticized before for making disparging remarks about Clinton, including calling her a "she-devil" and "anti-male." Outtake footage obtained by the website The Cut showed Matthews in an Iowa fire station, asking if he could "have some of the queen's waters." Then he said, "where's that Bill Cosby pill I brought with me?" The reference was to accusations that Cosby drugged and assaulted women. Matthews said that it was a terrible comment he made in poor taste when the Cosby case was in the headlines. He said, "I deeply regret it and I'm sorry." The website also listed some of Matthews' controversial remarks about Clinton, some of which were made on air. In Decemeber, the Daily Caller reported a former MSNBC employee received separation-related compensation after lodging a complaint against Matthews in 1999. While MSNBC confirmed a settlement to HuffPost, it did not reveal the nature of the complaint.